This approximate true-color panorama, dubbed Lion King, shows Eagle Crater and the surrounding plains of Meridiani Planum. 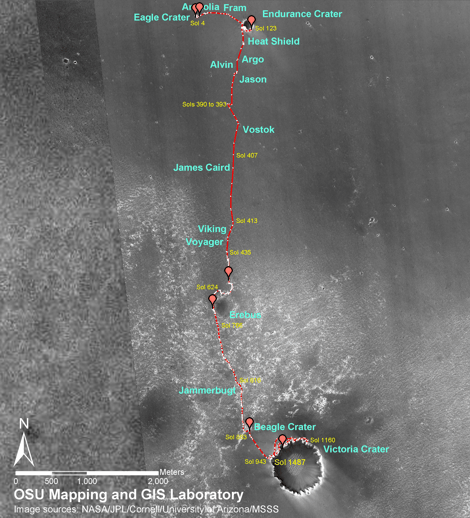 It was obtained by the Mars Exploration Rover Opportunity´s panoramic camera on sols 58 and 60. It was taken in eight segments using six filters per segment, for a total of 558 images and more than 75 megabytes of data. Additional lower elevation tiers were added to ensure that the entire crater was covered in the mosaic. This panorama depicts a story of exploration including the rover´s lander, a thorough examination of the outcrop, a study of the soils at the near-side of the lander, a successful exit from Eagle Crater and finally the rover´s next desination, the large crater dubbed Endurance.